Glide down the slopes and end up in a warm ski lodge! That is what your guests will think of when they see this Vintage Personalized Ski Lodge pub sign. A sunny background highlights snowy mountains and a high-flying skier. 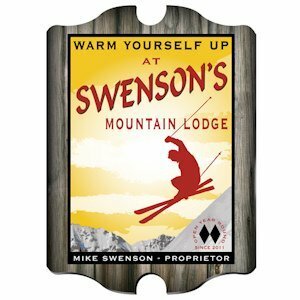 Perfect for mountain home owners or lodge operators, this vintage pub sign includes first and last name and year established.